El Monte Soccer for Success Does it Again! El Monte Soccer for Success has had a great history of enrolling players within the community who develop great stories on and off the field since 2012. Every season has success stories and players move on to the next chapter in their lives. In 2014, there was a success story brewing that not only made headlines for the program but continued to develop as a success story within the community and the hearts of a specific group of players. 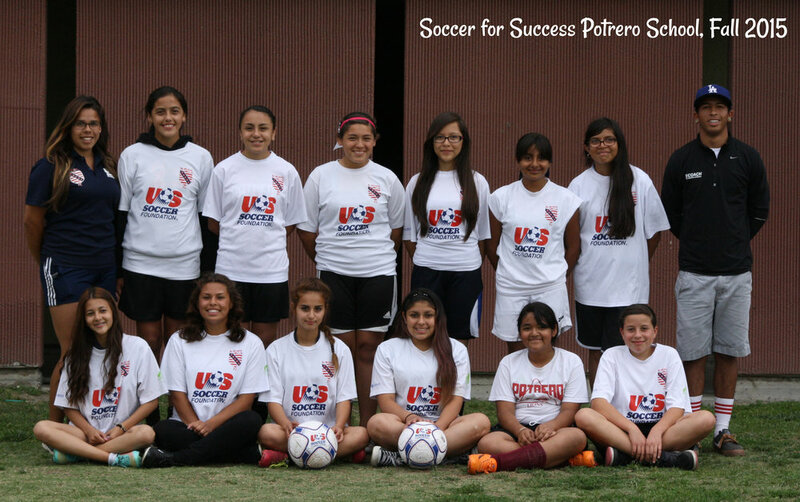 In the Fall season of 2014, there were enough girls in the El Monte Soccer for Success program at Potrero School to make an entire 7th and 8th grade all-girls All-Star team. These girls went two seasons playing with each other against other El Monte Soccer for Success teams at our weekly Saturday Game-Day tournaments. When the 2015 Fall season began, the original 4 girls stayed on the 8th grade squad amongst boys who completed the remaining team roster. Mayte, Ale, Marlen, and Nora kept the spirit alive for their team win or lose no matter what, after all they were happy to simply play for their last Soccer for Success season. What makes this story remarkable is the journey these four girls embarked on during their high school soccer career. Up until the 7th grade, only Marlen had played soccer outside of El Monte Soccer for Success. The rest of the girls had been introduced to the sport through Soccer for Success and their coaching staff. Through trial and error these girls remained close friends because of the sport of soccer and that only made them a stronger team on the pitch. They were dubbed “The Invincibles” by the El Monte Soccer for Success coaching staff and as they entered higher competitive levels in high school, there was no doubt they would live up to the name. Fast forward to 2019, Marlen, Mayte, Ale and Nora found themselves as Seniors playing varsity soccer for the South El Monte High School. By this time, Marlen had become a strong striker, Nora played sweeper flanked by Mayte and Ale took care of the rest as goalie. Not only did they ended the regular season with a 20-5-2 record, which is astonishing, but they moved on to show impressive results in the California Interscholastic Federation State tournament. With an 8-0 win on the first round, they blew across winning the second round, the quarter-final and the semi-final allowing only 1 pk against them. The Final ended in a 5-1 score giving the girls the win and their title as State Champions. What the future holds for these four individuals is yet to be known. What we do know is that it all started with a few coach-mentors and a program intended to teach them a great sport, healthy living habits, and lifelong skills.